She’ll Probably Be Upset (314/365 year 3) – Annoyingly Boring? Over 1000 days and I have never really featured my wife. She’s not a big fan of having her photo taken in general and I totally respect that. Last Sunday however I have no other usable shots. We were over my in-laws and my father-in-law gave me a couple old lenses he had for his old film Nikon. I put them on and started shooting a bit. It was all manual as the auto-focus didn’t translate to the old lenses. As a result most of the shots were total garbage. 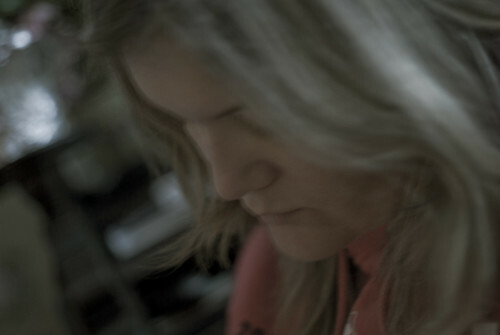 This one shot of my beautiful wife looking down while looking something up on her iPhone is the winner. The colors are a bit washed out, the focus isn’t sharp, it’s underexposed… but she’s still a knockout. She shouldn’t be upset, it’s a good picture. I’m trying to get my wife in front of the camera but it’s a slow process. I hope if the idea sits on her mind long enough she’ll let me take pictures of her.